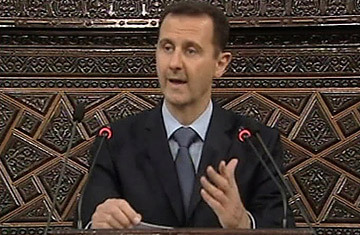 Syrian President Bashar Al-Assad addresses parliament in Damascus, March 30, 2011. It's not as if President Bashar al-Assad didn't have time to go through a few revisions of his much anticipated, much delayed speech before he finally delivered it to Syria's pliant parliamentarians on Wednesday. It fell well short of the expectations of many, but the MPs gushed over their 45-year-old leader, rising to their feet several times to cheer and chant "with our souls and with our blood we will sacrifice for you Bashar!" and "God, Syria, Bashar  only!" At least a dozen stood to shout their support during his speech, or spout sycophantic poetry  though some of the TV shots seemed to have been set up to capture these ostensibly spontaneous events before they happened. Visibly nervous at first, (his first words were "What is more difficult than clarifying this situation?") Assad quickly eased into a 45-minute speech, his first public comments since deadly unrest exploded onto the streets of several cities almost two weeks ago. His vice president Farouk al-Sharaa said on Monday that the speech would contain decisions that would "please the people." They must have been edited out of the final version, because on Wednesday Assad did not make any new announcements, beyond blaming "foreign conspirators" for playing a role in the country's unrest. He also stressed that his regime would not fall "like a domino" that had toppled rulers in Egypt and Tunisia because, among other reasons, his pro-Palestinian foreign policy was in line with his people's views, unlike the pro-Israeli leanings of Hosni Mubarak and Zine El Abidine Ben Ali. Acknowledging that the country faced "a test of our unity," he warned of attempts to sow sectarian strife in secular Syria's patchwork ethnic and religious society, and blamed satellite television channels for broadcasting "lies, lies and lies that they eventually believe is the truth." Just minutes after Assad descended from the ornate wooden podium in Damascus' elegant parliament, The Syrian Revolution 2011 Facebook page, which has garnered more than 97,000 followers, was urging Syrian youths to demonstrate. "Is this the speech we were promised?" it said. "I swear to God, it's scandalous that somebody like this rules us. To the streets shabab [youth] of Syria!" The President was widely expected to at the very least lift Syria's decades-old emergency law, something his adviser Buthaina Shaaban said last Thursday was in the works. Although he briefly alluded to Shaaban's laundry list of proposed reforms, which included a commitment to transform Syria from a one-party state ruled by the Ba'ath into a multi-party democracy, he did not elaborate on them. "There will be some people on satellite channels who will say 'this is not enough,'" chuckled the freshly clean-shaven Assad, who usually sports a thin moustache. "But I want to tell them, we are not going to destroy our nation. I think it's better for us to give the Syrian people sound decisions rather than quick decisions." The president used a fair chunk of his address to portray himself as a reformer. However, he did not indicate that he was stymied by members of the old guard of his late father and predecessor Hafez al-Assad  as has been the presumption. Rather, it was regional developments that had gotten in his way, including the 2003 Iraq war, the 2006 Lebanon war, and the fallout from 9/11 on the Muslim and Arab world. "It's not that anybody around me is against reform," he said, "we've just been late." The country's priorities changed to security and stability, he said, rather than greater freedoms. "We can delay the announcement of the formation of a political party but not a meal that a child needs to eat," he said to applause. "It was an issue of priorities." He was keen to stress that the recent talk of reforms was not a response to the wave of unrest that has already toppled two Arab regimes, and threatens several others  including his own. Many of the changes had already been drafted but not discussed in the parliament, due to more pressing economic and foreign policy concerns, he said. "Staying without reforms is destructive to the country," Assad said. "The challenge is what sort of reform." The truth, according to Ammar Abdulhamid, a prominent U.S-based Syrian dissident, is that the president doesn't really want reform, and will continue stalling it. "I'm very happy," Abdulhamid said after hearing the speech. "What [Assad] just did is he made our case to the Syrian people that no reforms can be expected, that he's incapable of reform. He lost supporters, he galvanized the people in the middle and I really think the protests right now will spread more and more."